July 11, 2000- Acroprint® Time Recorder Company, manufacturer of the ATR9800 Time and Attendance system and the Time Station, announces the new ESP180 electronic side printer, now available. 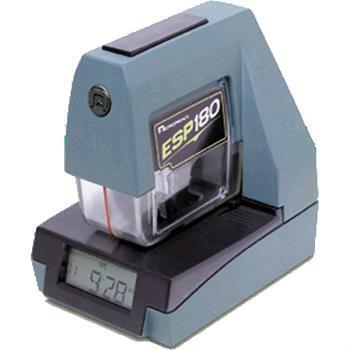 Featuring a unique design and new look for time recorders in the year 2000, the ESP180 allows for over 200 user print configurations, date/time format, consecutive 1 to 6 digit numbering, messaging, and left or right margin printing. This all new manual print time recorder has a suggested list price of $325.00 and offers dealers an opportunity for additional sales and profits. The ESP180 appeals to the small business person who wants the dependability of a quality time recorder which also possesses user-friendly features like a perpetual calendar, auto daylight savings time, and battery backup to maintain time when power is lost. The end user simply sets the clock once and forgets it.